Edisto  the island, the beach, all of it  never changes. Granted new homes, restaurants, and shops pop up, but those things arent what gives Edisto its pulse. Listen long enough and theres the unmistakable hissing sound of a wave before it curls onto itself and crashes on the shore. When the sea oats on the beach dance in the breeze they make the sound of salt coming out of a shaker onto an empty plate. Little red wildflowers grow in the sand whitened by the sun. Farther inland, the scent of pine needles sprinkled on the ground fills the air. These are all things you notice after spending years in Edisto. Like the thousands of others who make Edisto their home or home-away-from-home, I consider myself to have Edisto in my genes. My familys been coming since the 1930s, back when the oyster beds had to harden during low tide to get onto what is now called the town of Edisto Beach. My days coming here started back in the early 80s. This was a time when crossing the old and rickety Dawhoo Bridge was the only way onto the island and it seemed like anyone who crossed it was risking life and limb. I used to take off my seatbelt and wrap myself in my security blanket just in case we plummeted into the water below. Luckily, we never did. Its hard to remember that bridge sometimes now that its been replaced. Ive got a drawing of it framed in my room to this day. Even now that I live here, I get excited every time I see the landmarks along Highway 174 that ensure the beach is just a few more miles away. The mystery tree has always been there  aside from the one year when someone tore it down and a new one was put in its place  and decorated with everything from pinwheels to lawn chairs to American flags. Then there was what my family called the swingin bed. In some circles it is better known as the Edisto hammock. No matter what you call it, its simply a pile of mattresses suspended by ropes under an old oak tree and its the subject matter of thousands of photographs and paintings. Right after the swingin bed theres the Atwood Agency. I called it the shell building as a kid. Its where we stopped to get our key before we checked in and where I would be bouncing around with excitement knowing that we were about to be in the house, unpacked, in bathing suits, and on the beach within minutes. But nothing captures the feeling of excitement that I get when the trees lining Highway 174 peter out and the expanse of marshland cuts Edisto Beach off from the rest of the world. Thats when real time stops and beach time begins. As a kid, my family always stayed in a house down around the Point. This area marks the spot where the Atlantic Ocean turns into St. Helena Sound. I remember trekking through the sea oats, the sand was always blazing on my feet, and Id run down to the water and wait for my parents to hold my hand so I could play in the surf. And it was like heaven. Its been years now since I first started coming to Edisto. I live here now, run a summer business, and go down to the beach every day. 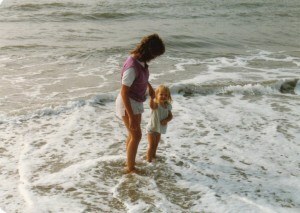 All the feelings I had for Edisto as a kid are still there, even though my circumstances have changed. But thats the magic of Edisto; everything in life will change, but Edisto remains the same. Edisto Island is deeply imbedded in my heart and soul. My first visit was the summer of 1991 and I have been back for many vacations since. I usually bring friends from California with me and we all rent a house on the beach along with some of my Georgia family. We swim, we cook, we shop for t-shirts and we have a the most fabulous time imaginable during that week. Please don't change, Edisto Island! I brought my two girls from the time they were infants, now they are grown and on their own, but still we return for "family" get togethers as often as possible. Cannot wait for the end of June!